Relationship boundaries stretch and occasionally break. In addition, change, innovation, or new initiatives may cause loyalties to evaporate. If you’ve never experienced the loneliness of leadership, I wonder if you’ve ever led. 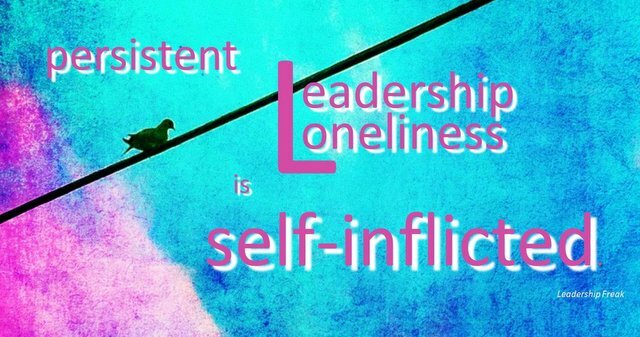 But, persistent leadership-loneliness is self-inflicted. Beyond the list of 12, I feel leadership-loneliness when I feel out of step with others. I find I care about things others don’t care about. I feel most isolated when people I care about make negative assumptions about my motives. There are legitimate reasons leaders feel lonely. Suffering because you’re keeping a confidence feels lonely. Following a dream that others don’t understand creates distance. Be who you are – take time to reflect. Faking drains you. Listen to dissent and examining your passions early in the process. Create a culture of ownership. Engage others in the process. How can leaders deal with loneliness? Leaders are lonely because they create space. All the 12 reasons create space between leaders and others. More the reason, more the space and vice versa. More the space,, more the leadership loneliness and vice versa. Leaders create space to protect their weaknesses and interest. They are self focused and that is the reason they perceive they are leaders and others do not accept them as leader. I have seen the people engaged in creating space often have more masks on their faces. They do not respond directly, they make the things complex. And that is their USP. Leaders can deal with loneliness by narrowing space and knowing themselves. I think, knowing,accepting and connecting are the key to become leaders. They should know who they are, strengths and weaknesses etc. After knowing they should accept it openly and finally you should connect with people. While it seems simple to do that, it is very difficult to practice it. But, when leaders practice it, they transform themselves. I think Ajay is on the money – I like the ‘space’ analogy. I do find it very challenging though when one of your own staff creates ‘space’ and doesn’t respond in the ususal manner. That creates frustration for me and then creates ‘space’ from me to them. It is a difficult and challenging cycle to jump out of. I think as soon as we start feeling different we can become lonely. It is amazing the energy you put out without saying or doing anything. P.S. That is one sorry Dog you got there Dan! Dan, it strikes me as interesting that the majority of the 5 cures for loneliness you listed involve intentional action by the leader relating to others (#2, 3, 5). Is it any wonder? We were created for community. I suppose that’s why emotional intelligence is so critical to a leader’s impact. I just finished reading a book one client suggested: Make the Noise Go Away (by Larry Linne). While not particularly well written and not specifically targeting the issue of loneliness, the book highlights the importance of a strong second-in-command. This individual, properly selected, provides first-in-commands with a counterbalance, accountability, a partner-in-crime, and best of all, frees up the leader to focus on the work they like and do best. Those strike me as all pretty good antidotes to loneliness. I think leaders are often lonely because they want to be. while wanting space, they also don’t want a lot of accountability in some areas. (Not all but some). I also concur with Scott’s assessment. Having just read Lead with Luv by Ken Blanchard and Colleen Barrett, it seems to me that Southwest has created a culture where C-level execs can’t feel lonely even though they do handle activities that create a level of separation from the rest of the company. It’s inspiring to read about how the culture was formed, nutured, and is safeguarded by everyone in the organization. One of the first types of leaders that came to mind for me was leaders of ministry, who have specific business-type demands but are also expected (more than the average businessperson) to be (singlehandedly at times) a source of emotional support for a large amount of people while leading an exemplary life. Ministry or regular, however, I think there is a tendency for leaders to lose touch with their inner core of people, the ones who really don’t care if the balance sheet aligned or the strategic plan got finished, who just appreciate the leader for who he or she is. If a leader has enough of those people in his or her life (and will let them “in”), then the leader will be much more equipped to deal with other kinds of situational loneliness. I really like this post, it reflects many of my own experiences. I just sent it to a ‘new’ leader in our community to help her get on the right track (hopefully!) Appreciate it! Have to wonder if you are a true leader if you are actively engaged in any of those 12 elements o’ loneliness. 2, 4 & 8 seem to be a particularly toxic combo for the person who wants the credit, wants the control and has a limited vision. As far as cures, definitely build an organic, evolving network (inside and out) and not only listen to dissent, encourage it…in a healthy way, but encourage it. If dissent is not there, appoint someone to be the designated dissenter…what a great role to have! I accepted loneliness as part of the leadership role and also mitigated it by having a coach, a gang of other CEOs that got together once a month to share travails and solutions (complete confidentiality, of course), and pushing myself to invite staff and Board into my thinking and the process. Enjoyed reading your thoughts on lonely leaders and the replies. Have you read The New Earth by Eckhart Tolle? Although not a book on leadership as it is mostly focused on dealing with ones ego however, I find it very relevant to leaders personal development on leading effectively. Based on my work with those that lead practicing situational leadership is the most appropriate cure for lonely leaders. Wonderful thought! So leadership loneliness is a message to you, an indicator, that you’re doing these 12 things (or some of them) wrong! You cure it by modifying your own conduct, not by seeking out company. That’s quite profound!